And to be honest I could have done a lot better, because I stopped a few times along the race to take pictures and tend to some minor medical issues. So without further ado, on to the recap! The weekend started on Saturday afternoon when we made our way down to Disneyland for the Health and Fitness Expo, where I needed to pick up my bib and other important race information. The expo was held at the Disneyland Hotel. After a bit of wandering and confusion, we figured out we needed to pick up my stuff “downstairs.” We followed a black carpet down a ramp into what is normally an employee parking area that was converted into race central. Everything was organized by the first letter of your last name, so after a short wait in the “M” line, I received my bib and some race instructions and signed a waiver promising not to sue if I died during the race. On the back of the bib was a tracking device, and we had to walk past a sensor to make sure it worked (I’ve always wondered about how they track your time – now I know!). The sensor was not only so race officials could track my time, but anyone who logged into the Run Disney website and registered could get updates on my progress via email, text message, or Twitter. Pretty neat! Next we headed upstairs to pick up my swag bag and enjoy the Expo. There were lots of vendors hawking their products – headphones, nutritional bars, shirts, headbands, hats and visors. I bought myself a Team Sparkle visor (I wanted the neon pink but settled on black because I would get more use out of it – I hate being practical sometimes) which came with a free pair of running socks, and a Roo Sport magnetic pocket that clips onto your shorts. It was only $20 and will allow me to run (if I ever run again) while wearing my yoga pants or any of my other shorts that do not have pockets. It’s basically the perfect size to store keys, my ID, and my iPhone. There was also some fun Disneyland merch on display. I *almost* bought this awesome shirt but I thought maybe it wouldn’t be smart to buy it PRIOR to the marathon, because at $35 that would be an embarrassing reminder if for some reason I didn’t finish. They also had official Disneyland Half Marathon wine glasses. It crossed my mind that it would be hilarious to run with this for water refills. But I would probably drop it and break it before reaching mile one. After the expo we grabbed some lunch at Rainforest Cafe with our friends Wendy and Jeff, who were also at the Expo. After lunch we headed over to the Hilton, our home for the weekend. Check-in was breezy, and once we were settled we walked over to the Grand Californian Hotel for some dinner. We had a late and large lunch but we needed a little something before bed, so we split their cheese platter which is SO GOOD. After that we walked back to the Hilton for an early bedtime. I set the alarm for 4:15am and went to bed around 10pm. But I didn’t fall asleep. As I found out during our wedding weekend, I can’t sleep when I’m super excited/nervous/scared. I was tired but kept thinking about the race and feeling really nervous. I think it was mostly fear of failure and fear of the unknown. I considered trying to take some kind of sleep aid but I was worried it would negatively affect my race performance, and I knew even if I didn’t get any sleep my body would keep going from adrenaline. I did end up getting some sleep in spurts, maybe a total of 1-2 hours. I was already awake when my alarm was due to go off so I got up on my own and turned it off so it didn’t wake Mr. BFT. I got ready super quick but ended up waking Mr. BFT in the process, so I got a good luck hug and was out the door! I walked over to the start of the race in the dark surrounded by other racers, so even though I was alone, I didn’t feel alone. On the way over I chatted with a woman who was dressed in a grass shirt and other tiki embellishments – very Adventureland. It was her first half marathon, too. We navigated our way through the crowds and confusion but we were placed in different corrals so we eventually parted ways and I made my way to corral G, the last corral, by myself. At that point I was pretty much last in line. Of 17,000 people. The race was set to start at 5:45 AM and a few minutes before, there was the singing of the national anthem along with a few fireworks. Then the announcement came that the corrals were being released in five minute intervals, which meant that corral G wasn’t going to start until 6:15am, 30 minutes after the official start time. I felt super frustrated and sat back down to do some more stretches and eat part of my snack, which I was saving for mile 2 or 3. I was really surprised when my phone buzzed just then, and I saw a text message from my friend Courtney wishing me good luck! I couldn’t believe that a) she was awake and b) her excellent timing! She got me motivated again – so thank you, Courtney! After a long 25 minutes it was our turn to move forward. It took a full five minutes to even walk to the starting point so by the time the front of our group reached the start line, it was time to GO GO GO! It all happened so quickly and we were off! And yep, I totally got high fives from Mickey and Minnie to start the race! I didn’t want to start off with running immediately because usually I walk the first half mile as a warm up any time I run. But everyone around me was running and I got swept up in the moment so I ran a bit right off the start. Somewhere between miles 1 and 2 we entered the backlot of Disney’s California Adventure. They had a few parade floats lined up along the way, like this one from The Incredibles (which was also a very popular racing costume, naturally). Then we entered the park from behind the Paradise Gardens dining area and ran towards Paradise Pier. The World of Color theme was playing and the dancing fountains were turned on. I wondered if the lights had also been on when it was still dark when the first couple of corrals made their way through DCA. It was also around this point when we reached the marker for Mile 2 and a cast member was yelling out that we were 12 minutes ahead of the the pace time, which was absolutely untrue because if it were, I was running 10 minute miles which I have never ever done in my life. The people around me and I had a laugh about it, but it also sounded good and got me a little more motivated and I stepped up my running. The Green Army Men were out in several places throughout both parks. I had no idea they were so popular. Next we were routed into Cars Land and ran down Route 66. I think they put up this sign especially for me. This is the first of many pictures of my giant, sweaty head with cool stuff in the background. I also can’t help but notice there’s an abundance of, how can I put this … “not skinny” women in this picture, which gives you a clue as to my running level. Yeah, I may seem fairly fit but my wonky heart puts me in the same category as the overweight runner. Womp womp. Lightning and Mater were out for photo ops (not pictured: Ramone playing some jams). We wound our way through Hollywood Land and past the Carthay Circle Theater and Taste Pilot’s Grill and out of the park through more backstage area. I really wasn’t paying attention and kind of lost my bearings but I feel like we maybe went underneath the Esplanade area? We went through this little tunnel and came out amongst more backlot area. But next thing I knew we were turning into Disneyland! We entered from between the Emporium and the firehouse. At this point I should say that all along the backlot areas and through the parks, there were tons of cast members standing along the route, clapping and cheering and giving high fives. Some wore Mickey gloves and I loved high fiving the Mickey gloves because I’m a huge dork. Tiana, Naveen, and Louie were the first characters seen inside Disneyland, and just down the way was Aladdin and Jasmine. I did not stop and take any photos WITH characters because the lines were long and I was trying to finish with a decent time. We swung left towards Frontierland after passing the hub and the castle. We ran towards the Rivers of America and made a right at Mark Twain, going past Big Thunder Mountain and Ranch. And yes, the petting zoo animals were out to greet us! Once we entered Fantasyland I noticed the Dumbos were flying so I asked someone to take a picture. Of course they lowered right then. Next we swung around the carousel and went through the castle. Once we went over the drawbridge we headed left into Tomorrowland. Darth Vader and a couple Stormtroopers were out for a photo op. Then we headed around the Matterhorn and towards Small World where a ton of princesses, including Merida, were posing for pics. Then we headed into Toontown. The train was out and the conductor was waving and blowing the whistle for us! Here’s a picture of me trying to get the Toontown sign in the shot. Just use your imagination. We left Disneyland through Toontown and worked out way through some backlot areas, including Circle D. A couple of the Main Street horses were out to greet the runners. Circle D is HUGE! I had no idea. From here we were dumped out onto Harbor and the scenery gets pretty boring so I put my earbuds in and started listening to podcasts. Between miles 5 and 6 we passed a mexican restaurant where a mariachi band was playing and there were dancers. They were NOT handing out margaritas (boo). Between or around miles 6 and 7 we passed by several classic cars that were parked. The owners (or at least I hope they were the owners) were honking horns and revving the engines and generally cheering us on. One lady was handing out paper towels and I’d like to give her a personal shout out. THANK YOU, PAPER TOWEL LADY. Classic cars aren’t really my thing and it was kind of frustrating that no one would give me a ride to the finish. It was kind of a big tease. Pretty soon we reached mile 8, my lucky number. Remember that my group started about 30 minutes late. I generally run/walk 4 miles in an hour so I knew I was pretty much on pace with my average time. It was during Mile 8 that my knee started to give me trouble whenever I ran for more than 30 seconds. Right around Mile 9 there was a medical station where I could put some numbing gel on my knee which helped slightly. Between Miles 8 and 9 there were more classic cars, including a famous new classic car. I yelled “KA-CHOW” at the owner and he looked at me like I was speaking Chinese, which made me wonder if he was even the owner of the car, but I really didn’t have time to slow down and think about it too hard. Also between Mile 8 and 9 we ran along a ravine, which made for a nice change of scenery. After the ravine we started heading right towards Angel Stadium! There were tons of people in the stadium cheering us on! It was pretty cool. After we exited Angel Stadium I recognized the apartment building of my friend Nerissa, so I took a picture (not pictured here for her privacy) and texted it to her. I wasn’t sure she would be awake because it was pretty early. But a few minutes later she sent me back a picture of us from her roof deck! I have NO CLUE if I’m in here somewhere! Miles 10-13 were pretty rough and honestly pretty boring. Every now and then there would be a group of cheerleaders or a band from the area high schools. The cheerleaders liked to yell out names (your name was on your bib) and it was fun to hear my name being cheered. I gave a lot of pompoms high fives. And the bands were really fun, too. I knew I shouldn’t run and injure my knee further, but I couldn’t handle the thought of walking the final three miles, so I did short bursts of running with a stiff right leg and I’m sure I looked like a COMPLETE IDIOT. I would run like this until my left leg got sore from basically supporting my weight, then I’d walk for a bit, then I’d do the stiff leg run again. I did this for a couple miles but somewhere during Mile 12 I had basically had enough and decided I would walk the rest except when crossing the finish line. Just past the Mile 13 marker we were back on Disney property at the Disneyland Hotel. I started looking out for Mr. BFT because he told me he would be waiting for me somewhere near the finish line. I rounded a corner and was totally shocked to see him with my friend Wendy and her mom holding giant signs with my name on them! They even dressed in pink for me! I was so excited and surprised I started getting teary eyed and had to stop and take a picture. I think I thanked them and maybe told them all that I loved them but I had to keep moving! Haha, I’m sure they knew that! At that point the finish line was in sight so knee be damned, I ran from there to the finish. As I crossed the finish I got high fives from Minnie, Dale, Goofy, and Chip! Once I crossed the finish line I remembered I could stop running now. It took me a couple seconds to realize that. Then I went back for a picture right past the line. After walking a little further they were handing out packaged cooling towels and just a little further past that we got our medals! It was shiny and heavy and mine. From here I tried to get back to where Mr. BFT and Wendy were but they wouldn’t let me through. So I called him and he said they were moving to the “Friends and Family” meeting area. (All this was happening in the Lilo parking lot, for those familiar with the area.) I needed to sit down so I grabbed some water and sat on the curb for a while and stared at my medal. I was half in shock and half distracted by how badly my legs hurt. I finished a half marathon. And I wasn’t last. I tried to pull my time up through my phone but the connection was lousy. I knew at that point I had achieved two of my three goals. After a few minutes I forced myself up and continued on through a picture area where they were taking pro pictures of everyone with their medals, which are supposed to be available online next week. Then I looked for my last name letter group and once I walked through the tent, I saw Mr. BFT, Wendy, and her mom waiting for me. Gross hugs were exchanged and Wendy presented me with a little trophy filled with pink M&Ms! I had read somewhere that chocolate milk was good to drink right after a race for the protein so Mr. BFT had one waiting for me, which I chugged. Meanwhile he told me I made good time and read me my stats. I was so super happy that even with all my picture stops and my bum knee I came in under my goal of 15 minutes per mile! If I hadn’t of done my stiff leg running I may not have made it. Mr. BFT asked me what I wanted to do next and I said I wanted to get back to the hotel ASAP. We walked as a group through the closed off Downtown Disney parking lot back towards the Disneyland Hotel. We parted ways with Wendy and her mom who were parked at the hotel. I felt bad that they basically stood out in the sun to see me walk by for a few seconds but they said they understood. It was so sweet of them to come cheer me on and such a major surprise!! As we started to walk away from the Disneyland Hotel it crossed my mind that we never took a picture of me with my medal! So we remedied that immediately. From here it was a painful walk back to the Hilton, where I took a long, cold bath followed by an equally long shower. The original plan had been to celebrate at Trader Sams but I was in no mood to deal with extra walking and fighting the traffic to get to the Disneyland Hotel area just seemed pointless and silly. We decided to grab some lunch and drinks at the Hilton pool bar, which our room conveniently opened out to via a sliding door. Walking the 30 yards from our room to the bar was extremely painful but I did it! The ultimate race reward – a fruity rum drink. There were actually lots of people at the bar area wearing marathon shirts, but I was the only one wearing her marathon shirt AND the medal, because I am awesome. Or clearly a first-timer. Whatever, totally didn’t care. I EARNED IT. After lunch we drove home and immediately annoyed the cat by laying the medal around her little neck. Because, why wouldn’t you? Congratulations, you reached the end of this “marathon” post (*snort*). I wish I could give you all medals for making it to the end, but until technology allows that, I will simply say THANK YOU for your loyalty and support during this amazing journey. I also want to give a huge THANK YOU to the hundreds, probably thousands, of volunteers who worked to make this race enjoyable and as comfortable as possible, especially the volunteers who had to stand for hours in the sun at water stations. And to answer the question on everyone’s mind – Will I run another half marathon or full marathon? Right now the answer is, “I don’t know!” I’m torn between the thrill of the finish and the extreme pain in my knees and glutes. I would certainly need a lot more training. And one thing is for sure, I would only run DISNEY races! 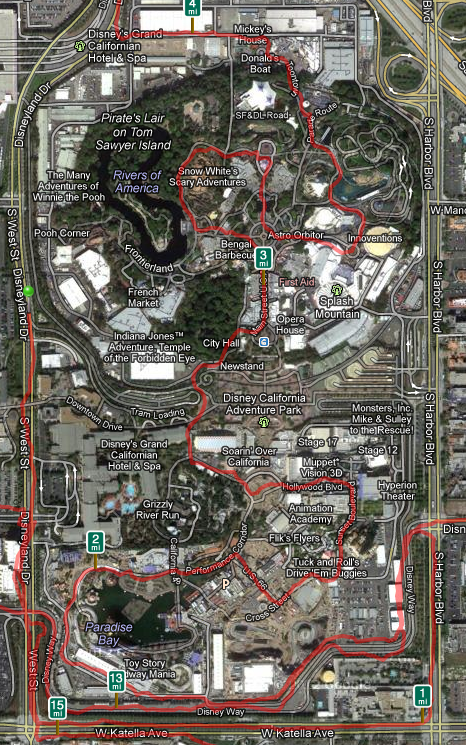 Love reading about the race, I have never been to Disneyland, but have down some WDW races. I agree 110% Disney races are the only way to go  You did amazing and I loved all of the pictures, you should be beyond proud!! I also especially love Walter showing off the medal!! This is so inspiring, Mindy! Really, I started reading your post and I was like “Damn, now I wanna run a Disneyland half marathon!” Then I kept reading, and I had to send it to my boyfriend to read it too, because, come on, you run through the parks? AWESOME. Then I read about your knee and I was like “I have bad knees too! Ohmygawd maybe I can do it!” And now I’m already in search of a trainer to see what I need to do to get my knee in shape. The conversation on gtalk with my boyfriend is going like this “Screw losing weight, let’s be runners! Let’s train for that instead!” And he’s already searching training plans. Hey, if we actually run a half marathon, I’m blaming it all on you. Congrats! I’m all teary reading your story! What an awesome accomplishment! You’re awesome Mindy! That looks like it was so much fun. I lol’d at the idea of running with the wine glass. Maybe next time, right? CONGRATS!! So exciting that you ran it and finished it in the time you wanted!! What a fun race, too, through the park!! Awesome job, you should be very proud! YOU DID IT!!!!!!!!!!!!!!!!!!!!!!!!!  I knew you could! I’m so glad that Wendy and her Mom (and Mr. BFT) were able to go and surprise you at the finish line. That was such a cute picture. I don’t know how you remembered to keep going. I probably would’ve collapsed in sobs right there. haha. I loved seeing the backstage areas. I haven’t seen any of that since our wedding day photo shoot. I loved how they had all the CMs and characters cheering you on. If I’m ever crazy enough or get super powers and decide to do a race, I’d definitely do it with Disney. It looked so fun. I’d rock your medal everywhere! In fact, next time I see you, I expect you to wear it.  Congrats Mindy! Congrats Mindy!! I did the Disneyland Half in 2009 and it was my first half marathon ever and I’ve now done 5!! But the Disneyland Half is my favorite by far. Granted I did injure my knee during the first run and never properly rehabbed it so now when I go on long walks it starts hurting. I’m out of commission this year. Don’t be like me and remember to stretch and ice your knee! Even though it’s been a few days from your race day and you may feel fine already, you should do clam shells and leg lifts and also foam roll your IT band (You can probably google or youtube this). Foam rolling is going to hurt like mad but it’ll release the tension that’s pulling on your knee caps. Congrats once again and such an awesome half marathon recap. Congrats Mindy! You achieved your goal and had fun doing it! Yay! This is so inspirational, Mindy! congrats on all your hard work! It sounds like it was a blast. I hope you do another one.  I feel inspired like I have to do something…go Mindy! “Between miles 5 and 6 we passed a mexican restaurant where a mariachi band was playing and there were dancers. They were NOT handing out margaritas (boo).” BAHAHA only you and I would think something like that. Too funny. Congrats on the finish. You make me want to do a run at Disney too! Thank you EVERYONE for your kind words! I’m so proud of this accomplishment. I never in my life thought I could do something like this. Now that my legs are starting to recover, I’m looking for more races to run! SO HAPPY FOR YOU!!! I was supposed to be there with Wendy that morning but I left my pohone at work and didnt leave until 230am subsequently missing my alarm in the morning  I am so glad they were there for you!!! You did so amazing (ad in a stylish way!!) I couldnt be more proud to know you!!!!!! I love that they have all teh characters out and that there are so many things to see and do. I have probably run over 50 races with my dad and have never had thigns to do DURING a race hahaha. That is so neat! But i am so impressed Mindy! I will be running this next year and i think it would be so cool if you were there again! Congrats Mindy! I wish I’d known Wendy was going to be there! I would’ve tried to join her. I’m glad I got to look from the deck though!  I had already been putting my shoes on when you texted me so I ran up there.